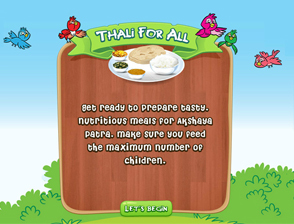 The Akshaya Patra Foundation Has Created a Game, ‘Thali For All’. ‘Thali for All’ game is available on our FB page. 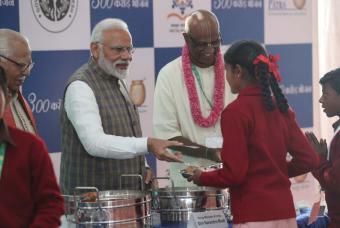 It gives a feel of how Akshaya Patra kitchens operate, adhere to quality standards and serve nutritious food. Play and enjoy. For the first time since its inception, The Akshaya Patra Foundation has created a fun game application titled ‘Thali for All’. Accessible from Facebook, this application was launched recently by Sridhar Venkat, Chief Executive Officer, The Akshaya Patra Foundation, along with other Akshaya Patra employees. Most of us who are fond of gaming have played various games on Facebook. Then why not try gaming for a cause? We have designed this game to be very user-friendly. The participant is given a requirement of about five or ten meals. Next step is to choose the quantity of each dish which includes number of rotis, serving quantity for sabji (vegetable dish), rice, etc. Before the batch is despatched, the participant has to do a quality check. One or two Thalis will have a specific food item missing. If the participant misses to spot this, he/she is disqualified and will have to start again. The process is then repeated. As soon as one set of requirements is complete, another comes in. The game continues till the food items are completely utilised. The winner is selected based on turn-around time, minimum number of errors, and maximum number of meals delivered. Through this game, in a light and entertaining manner, we intend to give the gamer a feel of how the Akshaya Patra kitchens operate. Just as is in the game, at the Foundation, priority is given to quality of meals since that’s of prime importance while cooking meals. Another important aspect in our kitchens is time management since the meals have to reach the schools before the children break for lunch. ‘Thali for All’ is an entertaining game which also serves the purpose of highlighting the importance of a mid-day meal to a less privileged child in school.